Why do they fight is the natural question?. Can they not live in peace and harmony ? I think they fight for the same reasons as the human fight. They are also living creatures with emotions ,fear, hopes and dreams. They fight to defend their territory, mating rights ,their mates and the food resources and of course their dwelling places however temporary they might be. I have observed a number of birds such as mynas ,doves, pigeons ,peacocks ,peahens ,house sparrows etc fighting during breeding and non breeding seasons. Last year the breeding season was over by the month of September and most of the peacocks had moulted all the tail feathers . 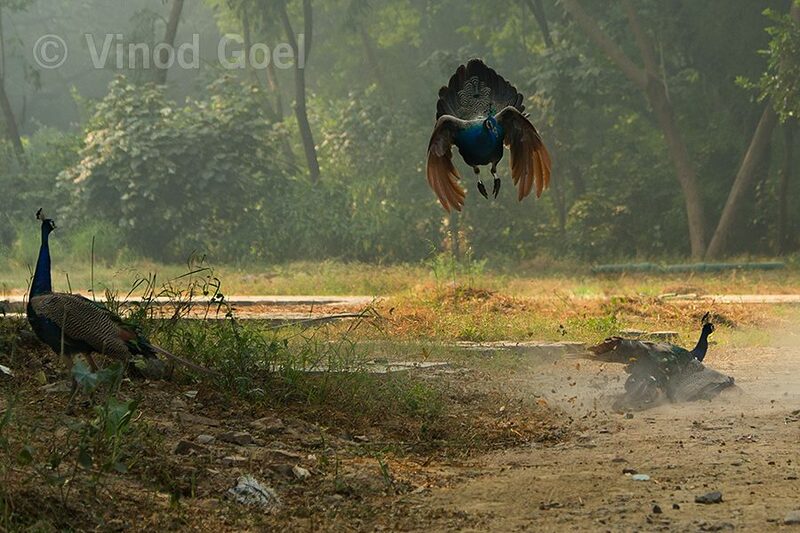 I happen to observe a fight between two peacocks on 15th October 2016.The way they fought in the air and on the ground and the poses they gave were remarkable. I am sharing one of them . I am sure you will love it. Like two wrestlers they fought . One of them slipped while defending the probable attack from the opponent which is still in the air ready to pounce on the rival. Yet another one in the vicinity is observing the fight as if trying to understand the tricks of the trade. Enjoy the fight as I enjoyed the real fight from the eyes of my camera.